While the ultrasonic scanner has its advantages over the optic in-display scanners used in other phones, there have been some hiccups. When Samsung first launched the Galaxy S10 and S10+, accuracy was a problem, as many complained it was both slow and giving them the "No match" error too often. An update was pushed immediately to fix both of these issues, and while the the "No match" issue was resolved, the speed was still not on par with traditional fingerprint scanners. That's finally changing with two new updates Samsung issued starting April 11. One is the the March 2019 security patch, which contains kernel-level improvements to the fingerprint scanner. But the update that really made a difference — at least in our experience — was a new version of the Biometrics app. So if you're stuck waiting on your carrier for the March 2019 OTA, check the Galaxy Store for an update to the Biometrics app and you should still see improvements. Based on our testing, it made unlocking 438% faster. The phone took an average of 2.50 seconds to recognize a fingerprint and display the home screen with the February 2019 security patch installed, but now it's unlocking in a mere 0.57 seconds with the March update and the new version of Biometrics. It's very noticeable, but you can see just how much faster it got in the above GIF. 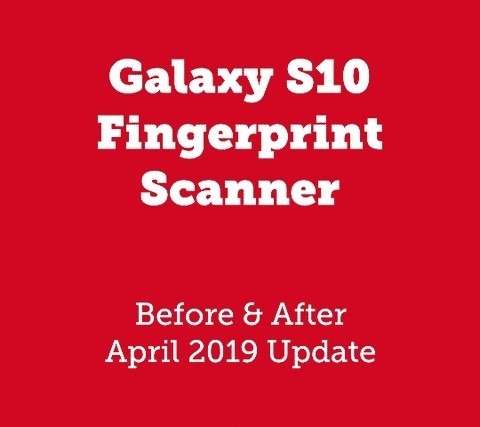 However, we had always had issues with the fingerprint scanner on our S10+, so the difference may not be as noticeable if your device was already unlocking in a reasonable time. Aside from improving hardware drivers to speed up the actual fingerprint scanner, Samsung achieved this boost in speed by altering animations. Previously, when the phone recognized your fingerprint, it would fade in from black and the home screen icons would zoom onto the screen. Both of these animations are now gone, replaced by a faster "wipe" style animation.